Frank Borman commanded Gemini 7, which was part of the first space rendezvous mission, and commanded Apollo 8, the first flight to orbit the moon. He was born in Gary, Ind., on March 14, 1928. He received a Bachelor of Science degree from the U.S. Military Academy, West Point, in 1950 and a Master of Science degree from the California Institute of Technology in 1957. He completed the Harvard Business School’s Advanced Management Program in 1970. Borman was a career Air Force office from 1950 to 1970, when he retired with the rank of colonel. He served as a fighter pilot in the Philippines, as an operational pilot and instructor with various squadrons in the United States, as an assistant professor of thermodynamics and fluid dynamics at West Point and as an experimental test pilot at the USAF Aerospace Pilot School. He was selected as an astronaut by NASA in 1962. In December 1965, he and Jim Lovell spent a then-record 14 days in orbit aboard Gemini 7. During the Flight, Gemini 6 astronauts Wally Schirra and Tom Stafford were launched and executed the first space rendezvous, with the two ships maneuvering to within one foot of one another on Dec. 15. Three years later, on Dec 21, 1968, Borman, Lovell and Bill Anders were the first humans launched toward the moon and the first to ride the mammoth Saturn V rocket. While orbiting the moon on Christmas Eve and relaying television pictures of its rugged surface, they captivated millions of viewers by reading from the Bible’s Book of Genesis. In 1969, Borman served Eastern Airlines as a special adviser, and a year later he was named vice president-operations group. He worked his way up in the company and was elected president and chief operating officer in 1975, moving up to chief executive officer later that year. He became chairman of Eastern’s board in 1976. 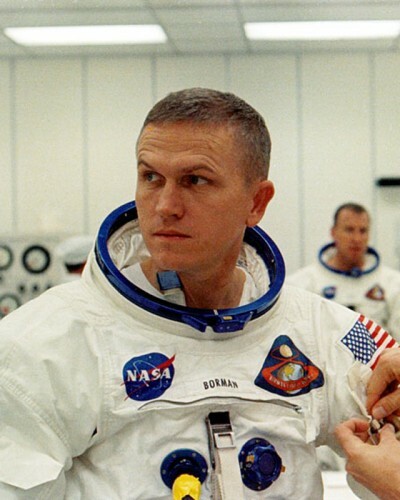 Frank Borman was inducted into the U.S. Astronaut Hall of Fame on March 19, 1993.